4:35 Michael Mulgrew greets us, thanks us for coming. No contract yet, will continue negotiating. Welcomes new chapter leaders to much applause. “Welcome to the nuthouse.” Says CL job is backbone of union and is so hard. Do not forget how much good you are going to do. You will touch and help the majority of people in your school. Says you cannot do job alone, must have team. Look for people and bring in others. Be inclusive. Bring in folks who may have been quiet for years, Give them a chance. You will be able to help and we will give support. This is why unions are important. We’re there for people when they have a tough time. Thank you. It will be tough but you will do great things. Last year was Janus. Says we did good job. There is no longer an agency fee payer. Last year we had over 2K AFP. By August were 410. Lowest number by far. Will update at DA, because we’ve been working on new hires. We put together aggressive plan, including two weeks of training. Before day one, 2600 of 4K had signed up. Some small locals had their contact lists used by anti-unionists, Westchester, near Rochester. Right now there are fewer than five people who’ve dropped UFT. Says we did a great job. No one has had results like these in other states. Has faith in UFT. At first DA will review Roberts Rules. Class size reports tomorrow. Reporting important. Upstairs negotiating is going on right now. Membership teams were successful, involved people. We must move that forward. Have set up communication network. Not just UFT sending emails and texts. Would like contact list from every worksite. Name, phone and non-DOE email. No union business, ever, on DOE email. Parental leave—seems we’re having a spike in pregnancies. If members have questions, please call borough offices. 750 applications, 446 already approved, first checks will go out next week. People are in every borough office who can explain. Asks we refer them to borough office. New members: asks who has them—report that there are now 4400 new teachers. Says we must speak to all, and they should be referred to borough office programs. Wants CLs to help them stay in profession. So far we haven’t been affected by teacher shortage like other places in the country. One Southern district needed 241, opened 110 short. States have defunded education, denied raises for a decade. In NY we have bucked trend and spend more. New teachers may be still smiling now, but next week is first full week. Remember where you were first year. You were going to change the world. They are the same. Don’t squash their dreams. Help them through. Let us know if you form new teacher group in school. Work focus of union has been shifting. We need to move it faster. Every school site should be an organizing site. We are good at solving people’s problems. Schoolwide issues should be addressed in consultation committee. You need to work with whole school rather than individual issues. We have contractual rights. Not all are implemented. We have to focus on this and enforce rules. Problems that you cannot solve should be sent to us. Lawyers are controlling disciplinary system and central staff thinks their job is to support principal no matter what. We want to help children. We didn’t do this to be rich of famous. If leaders believe that, there will be better results. Big restructuring at DOE, and some decisions give us hope. Asks new CLs to go to training. Politics—NY—Last year we had a bill passed by Assembly, supported by Cuomo, said NYS would no longer mandate test scores. Senate blocked it. Primaries over. Goal not primaries. Goal to take Senate back to people who will pas that bill, fund education. We also need to call US Congress. DeVos was outsmarted last year when she tried to gut ed. programs. Wanted to kill wraparound services, funding for children in poverty, special ed., teacher training. Were actually increased. Will not happen again. Was able to say non-public schools don’t need certified teachers or licensed clinicians. Not about person, about best interest of profession, members, caring for families. DC wants to privatize all. With larger turnouts, more seats will be won. UFT largest union in New Jersey. We need to work with members, many in retiree chapter. 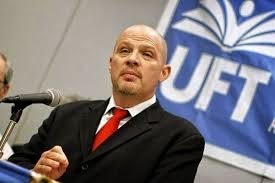 UFT also largest union in Florida. Goal is APPR law we want passed in NYS legislature. Moratorium sunsets, and test scores will become 50% of teacher ratings. We will go after state and federal officials who do not support us. This meeting last year we had Constitutional Convention. Once we got through that, we would prepare for Janus. We destroyed CC in every county in state, and came through Janus in a way that was unheard of, due to work of CLs. This year there is not as much apprehension, but we never know what will happen. We will plan and deal. Do the same thing at school. Plan, don’t panic. Have your own friends at school level. Come up with plans and move school. Thanks experienced CLs for staying. There are times when you ask yourself if you really want to keep doing this. But like teaching, it helps people and makes a difference. Help, organize, and show people they can make a difference. CL backbone of UFT, thank you very much. Some teachers are assigned to teach out of license. One has entire program out of license, Principal not talking, How will they be evaluated? A—We will try. There will be changes. Frequent changes lately. We have to change culture of evaluation in order to move ahead. New teachers will leave because system isn’t working. Were principals trained on observations? No. They norm and that’s it. In any other system, first thing they do is train in how observations are conducted. No one here has had that training. How can you have a good discussion if people weren’t trained? Principal’s have PPO and quality reviews. They will say instructional programs are weak. Then principals mandate and collect plans. How does that help? What’s important is not plan, but what happens. Must address this to move forward. I have seen great practices, with real discussions. Q—We had new school built. We now have no parking. Very tough to pay $13 180 days a year. Can union help? Nearby school has many spots. A—There is a process to create parking. I’m game to try. People don’t like having parking removed. You get bad reactions. Start at community board, not city council. We have a lot of churn at some schools. Those schools have vested interest in helping. Q—Contract negotiations—What can I say to members? A—You are member of committee, and you can’t answer. Q—If some districts can hold over K and special needs students, and others can’t, what will first grade teachers do? A—No one held over in your district? This could lead to a lawsuit. System wants everyone literate by grade 3. We need proper supports for the child. Teacher protected because they need only growth, not grade level. I get upset because school could be labeled, could be stigma. Will be state list next month. Third year of Renewal. Decisions will be made at third year. practice could be issue. A—DOE and city seem to be trying to figure where money is. Still looking for 4 billion from Albany. 300 lawyers at central may be issue. We say if we’re getting all this funding, why don’t schools appear well-treated? Hearing more and more of that. Some schools have improved with people working together. If we want children to do well, city should make schools look great. Q—Principal has instituted online grading. Has been fine. This year new system, teachers are unhappy. Took away discretion. Very easy for students to pass. A—We can question policy via contract. If principal changes to show more people passing, means they are trying to make their own evaluation better. This is not online grading. This is making all kids get 55 no matter what. Q—We had charters pushing into our building. What is UFT stance on charters? A—Courts say charters want to be considered public. This is how they privatize. With transparency or serving all students, they are private. Want money, want space, don’t want to be held accountable for serving students or what they do with money. We sue them. Four chains doing this. Mom and pop ones seem to be trying to survive. Don’t have millions Constant fight, and we will continue. 12 years ago charters thought they would have half of city schools. They lost. Fight still continues. Five years ago was horrendous. Now we run localized campaigns. Law is problem because charter has right to city space. We have to prove school doesn’t have space, and then they get other facility or we pay rent. Problem is schools have space. Others are at 2-300%. What about teacher teams? PPO asks for them but we have no agreement, or time set aside. A—Schools that want to do the work have worked it out. Others have no plan. We have to get to the point of having it not be a waste of time. This is part of what’s wrong with entire culture. We have two districts that now have master and model teachers training others. To be eligible, they have to do two years of inter visitations. These schools have moved instructional practice. DOE hasn’t done any of this. This was initiated by teachers. This may be a model of how to deal with observation. This was professional and collaborative. Q—We often get students counseled out by charters. Funding doesn’t come with them. They often have IEPs. If we have Democratic majority in Senate, maybe we can keep charter cap down. Will we try to decrease it or work for moratorium? A—We will have major discussions not just about cap, but about their serving all children. They never want anyone to look at their practices. Moskowitz claimed 100% grad rate. Was really 17 of 76. Wall St. Journal wrote it was ridiculous. They got away with it because there is no transparency. We think, with Democratic majority we can get more done. Q—Grateful to be part of union. What is your take on teachers agreeing to have observations recorded? A—I was also a mentor for new teachers. Feel very strongly about helping them. Asked permission to record. Was safe. There is benefit, but should be teacher’s idea. If principal pressures for it, it’s a bad idea. I was recorded and realized why kids sat in back right, because I asked questions from front left. You need to have a conversation about what they’re trying to do. They cannot impose. Maybe you could make this about entire observation process. Make this an opportunity. Q—MOTP—In district 75 attendance part of algorithm, which I’ve never seen. Principal says we should get them to school because we have an attendance teacher. Can we get attendance out? A—We will try to work this out with DOE. Adverse rating issues at all time low. We had bad anomaly of bilingual teachers who taught bilingual special needs kids, which we had removed. We will check into this. Q—Thanks union for support in tough times this year. Had chance to max out TDA. What would be best date to roll it back? A—Not answering. I don’t give financial advice. Mel Aaronson will help. We have two prominent officers retiring—Mel Aaronson and Carmen Alvarez. Cannot thank them enough for their service. Were selfless non-stop workers. Q—Our admin has been focusing on NPPR, (Note--I think this teacher was referring to PPO, the principal evaluation system.) principal’s rating, because it will affect our rating and school’s rating. First time I’ve heard of it. They want PD on it. A—Clearly they don’t have enough instructional people. Can look at it. Will send Jackie Bennett to observe PD. Q—What’s your relationship with Carranza? Good, fair positive, combative? A—Fariña was not good to have public fights with. We’d had Klein, Black, Walcott and Bloomberg all together. We were looked at as people who just wanted to fight with everyone. For Carmen, we tried to restore respect for profession. We had issues with her management. Policies moved back into right direction. Many members don’t remember bad times. Personally, chancellor is really good guy. But I do my job. What are we looking for him to do? We want DOE to support and help schools, not just control workforce via principals. Is it about control or education? If you harass and bully kids so they do worksheets, they don’t learn. We make decisions based on what union needs at that moment. We need to embrace and support working people at the schools. Bar was low when Fariña came in. Was comparison with Bloomberg’s last term. We need new chancellor to work with us to help. I’m optimistic. Just because you get along, for example, with principal, doesn’t mean you don’t have responsibility to staff. Glad we spoke, loved questions, if anything happens in negotiations you will be called quickly.